Whatever the reason we all love the beach so much, there are endless hidden beaches on Earth that will have you dreaming in no time. Sure, a crowded beach can be fun during college or on that family vacation, but don't you want to know where to find some of the most hidden beaches on Earth? Some so hidden that they are only accessible by land (think about that for a minute.) From some of the most remote corners of the globe to places you'd never think of finding a secret swimming spot, here are the most awesome (and hidden) beaches on Earth. 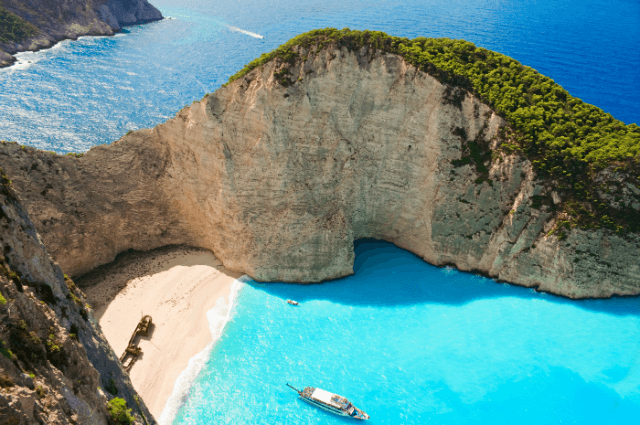 While it goes by many names, this spectacular beach in Greece might just sum up "hidden beach" the best that we've ever seen. It has the tall limestone cliffs, the insanely white sandy beach and to top it off, a ship wreck right on the sand - a boat which sank over 3 decades ago, how cool is that? Similar to Phi Phi Ley off the coast of Phuket, it is a popular spot with tourists and a boat trip (the only way to the beach) isn't cheap, you have to imagine it is well worth it, and probably with less drunk assholes than Phi Phi. Who said that hidden beaches had to be sunny? This amazing, and honestly fake looking, beach close to the coastal town of Algarve, Portugal has it all. It has the mystery with all the beautiful rock formations, the extreme secluded feeling and to top it off, small spots of sunlight. Ever wanted to impress a date (and find yourself on the coast of Portugal) - this has got to be the place to take her. While some beaches are special because they are only accessible by boat or hidden down a secret path, some beaches, like Whitehaven Beach in Australia are just the opposite, but just as hidden in a way. The almost limitless vastness of Whitehaven has plenty of room for everyone. No more having to find your little spot for the day, you can take a mile here if you wish. Throw down your towel and walk hand in hand forever without meeting another soul, truly spectacular. I was just as surprised as you were that I was able to include a US beach on this list, but Dry Tortuga in Florida doesn't disappoint. Again, only accessible by boat, Dry Tortuga is 70 miles off the coast of Florida and is out top pick for the best beach to go camping on by far. With a mixture of the beautiful blue water, white sandy beaches and green grasses waving in the wind, a trip here will not leaving you upset you came. Hawaii has long been known as boasting some of the most amazing beaches on Earth, but it is the black sand beach on Molokai that wins our top prize. Forget the white sandy beaches and step into something a bit more unique. While the black sand is simply caused by the volcanic rock in the area, it leaves the beach feeling mysterious, unique and somewhat other worldly - a much see if you are in Hawaii. Belize might not be on your top holiday destination list, but it should be. Quickly becoming one of the most popular tropical stops for young and old alike, Robles Point is different. It's different in the fact that you must take a boat to visit, it has barely any tourists, and to top it all off, it is one of only two beaches in Belize where the amazing coral meets the shore. Seriously, you have to see this place to believe it. A beer sounds good about now doesn't it? We might have just saved the best for last, and it is easy to see why. The Marieta Islands, off the coast of Mexico are some of the most unique around, and this hidden beach, now world famous to anyone searching for a little travel inspiration, is the absolutely definition of a hidden beach. You have to look twice to even understand how on Earth this beach is possible, but we promise you it is, and is one hidden beach on Earth you must get to before you die.